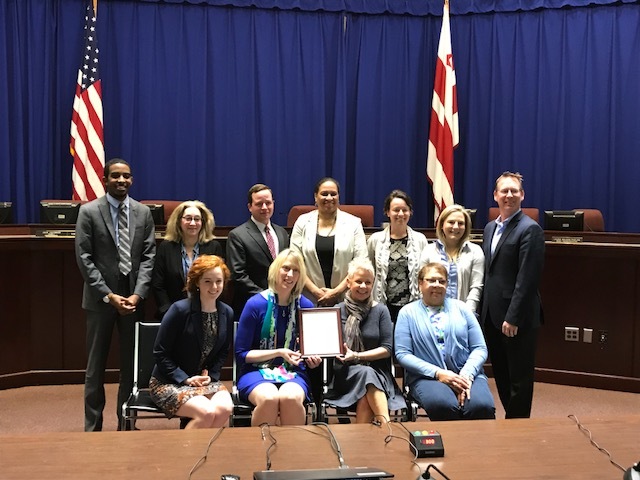 WASHINGTON, DC – April 18, 2018 – The DC State Board of Education (SBOE) recognized the Resilient Scholars Project (RSP), a program of the Wendt Center for Loss and Healing, with a ceremonial resolution. This honor represents DC SBOE’s conviction that mental health is an important priority for educators and policymakers across the District of Columbia and the nation. RSP provides vital mental health services to students in DC public and public charter schools coping with the impacts of trauma. RSP reaches students where they are—in their schools, and, for a select number of students, also in their homes. The project is grounded in evidence-based treatment models such as trauma-focused cognitive behavioral therapy (TF-CBT), trauma adapted family connections (TA-FC), mindfulness, and play therapy. RSP clinicians facilitate services using games, art, experiential activities, writing and other modalities to explain concepts to students and their families in developmentally appropriate ways. Last year, RSP served approximately 300 students ages 6-17 and their family members who had experienced trauma and/or grief. The Wendt Center offers an array of grief and trauma services to the Greater DC Metro Area, including in-office counseling, trainings for mental health providers and community leaders, Camp-Forget-Me-Not/Camp Erin DC, and our school and home-based services. The Center is deeply thankful for the opportunity to continue growing in this important partnership with DC SBOE as we work to build resiliency and bring healing to DC’s communities and students.